You can Know if Your Home is Too Tight or Leaky! Is Your House too Leaky or Too Tight? Both are a Concern for Poor Indoor Air Quality! Sometimes it's easy to tell if a home is too leaky. If there are drafts around windows and doors combined with unsealed interior water heater or furnace closets, frequently a trained observer can tell. If the house smells musty or stale air that can be a sign that your home is too tight. Standards are set by the Building Performance Industry on how many air changes per hour should occur in a home for that home to be considered energy efficient from an air infiltration standpoint (not too leaky) and still provide enough air changes per hour to make sure that it "breathes" enough air that it helps to dispel the build up of cleaning chemicals, cooking vapors, and carbon dioxide, etc. for the home's air to be healthy. What's great is you can know with a simple Blower Door Test! A blower door is a powerful fan that mounts into the frame of an exterior door. The fan pulls air out of the house, lowering the air pressure inside equal to about a 25 mile an hour wind blowing on all side of the house. The higher outside air pressure then flows in through all unsealed cracks and openings. There are two types of blower doors: calibrated and non-calibrated. It is important that auditors use a calibrated door. This type of blower door has several gauges that measure the amount of air pulled out of the house by the fan. Non-calibrated blower doors can only locate leaks in homes. They provide no method for determining the overall tightness of a building. 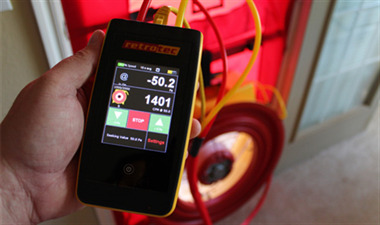 The calibrated blower door's data allow the auditor to quantify the amount of air leakage and the effectiveness of any air-sealing job. When our crews are performing a professional air seal, we always use a blower door to assure that we know the effectiveness of our measures and we work to make sure we do not get the house too tight. We spend so much time in our homes--air quality in the home is important! How can you benefit from blower door testing? Peace of Mind knowing that your home is not creating a "sick house" effect from it being too tight. Knowing that your home is safe when the air changes per hour are within acceptable limits. If testing shows a problem, the comfort of knowing that you have knowledgeable professionals that know how to address the problem, and will use blower door technology to work toward getting your home at optimal for the health and safety of your family. If blower door testing shows the need for improvement, you will be more comfortable once these improvements are made.